A head-to-toe multitasking oil. One product does it all: moisturizes, removes stubborn makeup, helps you shaving, gives new life to your hair (or beard). 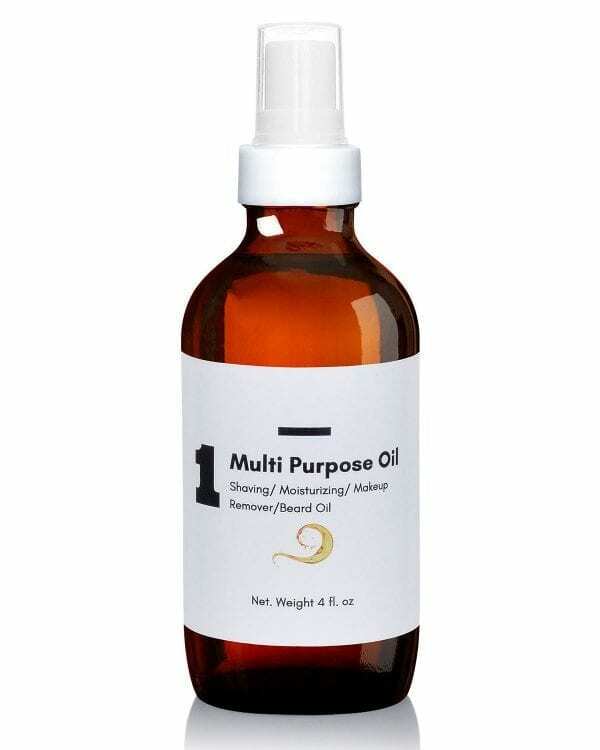 This multi-purpose oil is intended for normal skin. We don't fully embrace the concept of "skincare routine" which only serves the beauty industry by making you buying 10+ products; one, two, maximum three products are sufficient when they're produced with high quality ingredients and are not diluted. If you want to learn more, read this article I wrote and this answer on Quora. When it comes to cosmetics, having less ingredients grants a higher quality product. We have selected and blended the very best natural oils and are pleased to offer them to you. None of the ingredients is present at less than 2% which, believe it or not, is unusual in the beauty industry. We refuse to add ingredients at “marketing levels” just to claim they’re there. We don't overcharge for nice packaging or design. We only care about what's inside our bottles. Oils are classified as emollients; they nourish, lubricate, and keep the skin hydrated by locking in pre-existing moisture. This means that if your skin lacks moisture (i.e it is dry), applying oil alone won't help. You have to replenish natural moisture first. By using a 2 steps approach. Step #1 consists of drinking more water and avoid irritant agents (for example essential oils and fragrances). Step #2 involves the use of skincare products intended to replenish the skin with essential fatty acids, ceramides, and phospholipids. Hygroscopic ingredients are very useful , too, as they're able to subtract water from the environment and give it to the skin (for example glycerin). Multitasking: skin, hair, beard, cuticle, and everything in between. So you don't waste money buying several different products. Spray nozzle, use only the amount you need and avoid messes. Delivers a high-gloss, super-smooth finish to all hair types. Formulated by a professional cosmetic chemist ; quality and safety ensured. -Spray it on a cotton pad to remove make up and clean your face in a gentle and effective way. -Add a spray to your moisturizer (extra dry skin only). -Spread evenly to enjoy long lasting smooth skin. You can do this in the shower as well! -Spray onto your hands and then apply it to hair. One spray is usually enough. 100% PURE blend of Organic & Natural oils. VEGAN, GLUTEN and GMO FREE. MCT Oil (food grade), Almond Oil, Jojoba Oil, Olive Oil, Prickly Pear oil, Vitamin E, and Avocado Oil. MCT Oil (Food grade ) has excellent skin smoothing properties and promotes skin penetration of the other oils. It’s stable against oxidation for a long shelf life. Sourced as a palm-free, our MCT oil is derived from castor bean and coconut. It gives a non-oily, elegant after feel and has great spreading properties. JOJOBA SEED OIL is non-comedogenic and easily penetrates skin for a softer, smoother complexion. It mimics the lipid content of skin and helps prevent moisture loss and cell damage. It also increases suppleness to improve the appearance of superficial lines. OLIVE OIL originates in the Mediterranean basin and has been known for hundreds of years for its cosmetic skin benefits. The oil, derived from pressing the fruit of the olive tree, contains nourishing unsaponifiables to moisturize and restructure the skin. AVOCADO OIL is an exceptional moisturizer. it has shown efficacy to help minimizing the appearance of scars and stretch marks. PRICKLY PEAR OIL is one of the most luxurious cosmetic oils.It has excellent moisturizing, smoothening, and antioxidant qualities. It also improves the lipid barrier, and revitalizes matured skin. VITAMIN E is an excellent anti-oxidant and anti-inflammatory. It has good moisturization properties, and leaves skin feeling smooth. It also improves shelf life of other oils.